It’s been a while since my last post as I’ve been quite busy with my day job. Since I’ve been occupied with work I thought a workwear post would be appropriate. Plaid is a Fall staple and I was able to keep up with the trend with these belted high-waisted plaid pants from Suzy Shier. These pants are so comfortable and flattering. The belt accentuates the waist and instantly gives you more shape. The pants are cropped at the ankle and perfect for pairing with your favourite pair of work pumps. I styled these pants with a classic white work shirt. I typically don’t like long sleeved shirts so I opted for a more casual look and rolled up the sleeves. I added some pearls for some femininity to off-set this menswear inspired look. What do you think about plaid for Fall, can you make it work? It’s Wednesday and in my world that means one thing – Work Wear Wednesday! I don’t know about you but I’m totally loving pastels this Fall so I was overjoyed when I came across this pink power suit at Suzy Shier. 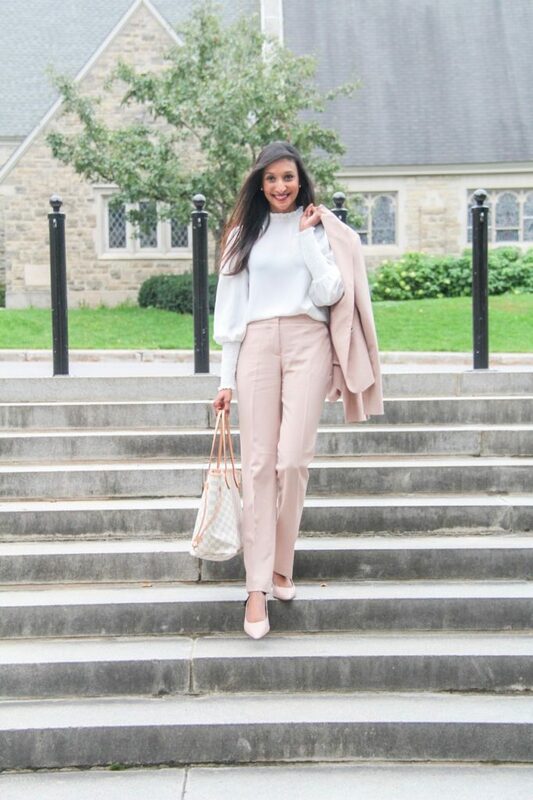 Pastels aren’t typically Fall colours but adding a little dusty rose to your Autumn wardrobe is a great way to incorporate some colour. 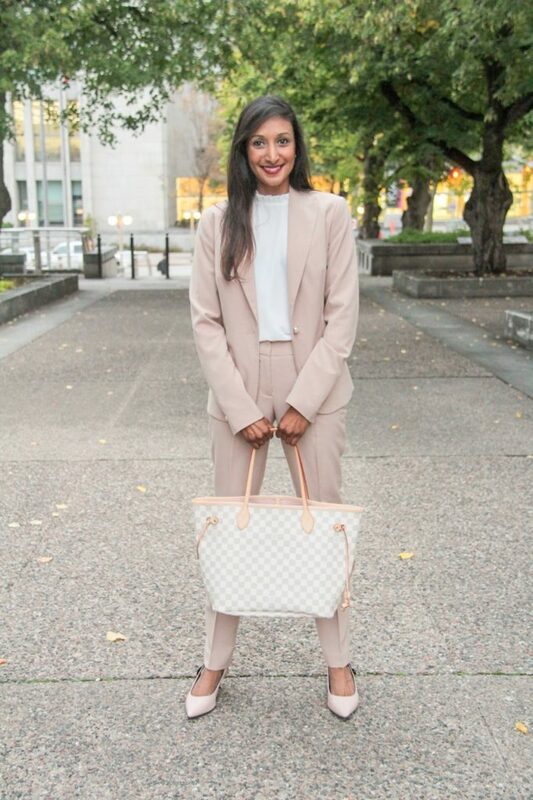 I love this pink suit as it adds some femininity to my work clothes. I have many other business suits but they’re typically grey or black – not the most interesting choice of colours. I’m also a fan of the pearl button details on the blazer that give it an extra layer of class and finesse. I paired this suit with a high neck ruffle blouse that I also picked up at Suzy Shier. The ruffle detail in the neckline and the smocking on the sleeves add to the feminine flair of this outfit. I wanted to go for a monochrome chic look with this suit. I added a pair of pink kitten heels and my go-to tote the Louis Vuitton neverfull MM. I have the neverfull in Damier Ebene (brown) and Damier Azur (white) as it’s such a versatile bag and a great investment piece. What do you think about pastels for Fall? Special thanks to Suzy Shier for sponsoring this post. 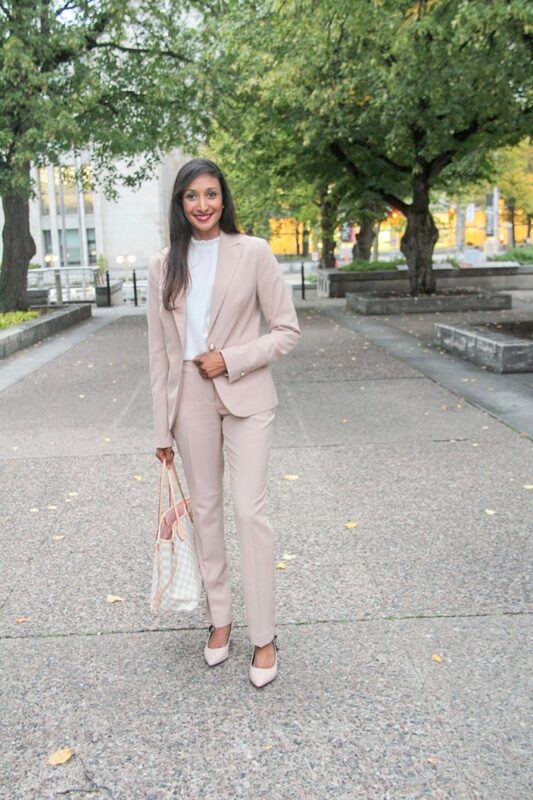 I’m so pleased to announce that I’ve collaborated with Canadian retailer Suzy Shier to bring you some of my favourite workwear pieces and tips for great 9 to 5 style. I was recently interviewed for their Suzy’s Stories blog. You can read my interview below 🙂 Special thanks to Suzy Shier for sponsoring this post. Hi Praveeni, thanks so much for joining us! So, tell us a little bit about yourself. Where are you from and what do you do for a living? I was born in Sri Lanka and moved to Canada as a child. I’ve been living in Ottawa for about 26 years so I pretty much grew up here. I work as a Project Manager and Professor at a local College where I teach international business. How do you balance being a fashion blogger and working full time? There’s definitely a lot of planning that goes in to balancing blogging and working full time. I like to think I’m pretty good at managing my time. I plan out my outfits and photoshoots for the week. Most of my photos are taken on the weekends – like the name of my blog The Weekend Fashionista suggests. How and why did you get into blogging? I’ve always loved fashion and putting outfits and looks together. 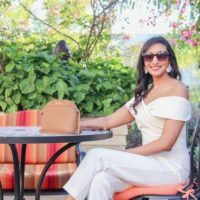 Over the years I’ve had friends and co-workers ask me where I got my clothing or accessories so I thought what better way to tell them than through a blog. I started documenting my daily style as a hobby and sharing links to the pieces I love with friends. As you love fashion so much, would you ever consider working in the fashion industry? How do you show your personal style AND stay looking professional in the work place? Any tips? I find accessories and accent pieces are a great way to show off your personal style in the workplace. I like to incorporate colour and texture in to my workwear wardrobe. I prefer a more feminine look so I’m usually in a dress or skirt at work. Whether it’s a printed blazer, a colourblock dress or a statement necklace there’s always a way to show off your personality and keep things professional at the same time. If you have a big meeting at work, what will you wear to feel confident? This is a tough one. I usually wear dresses to work and a structured work dress is a great confidence booster. For a more formal meeting I might throw on a blazer on top of the dress. I may also go for pants and a matching blazer, there’s a reason it’s called a power suit after all. When you’re wearing an outfit that you love you instantly feel more confident. What’s your go-to outfit outside of the office? Outside of the office my style is pretty relaxed and casual. On the weekend you can usually find me in a pair of jeans or jeggings and a sweater or blouse. I may throw on the occasional blazer if I’ve got dinner plans etc. after my weekend errands. Weekends are also great for showing off your creativity so I definitely enjoy getting dressed up and going out in the evenings. What are some of your favourite workwear picks from our latest collection? This sheath dress is so chic! It totally gives me the Chanel vibes with the fabric and cut. This blouse is so pretty, I especially like the smocking on the sleeves and the ruffle neck. This skirt would look great with a pair of opaque tights and a blouse – perfect for Fall and Winter. Fall florals are all the rage and I’m loving the print on this blouse and the detail in the buttons. 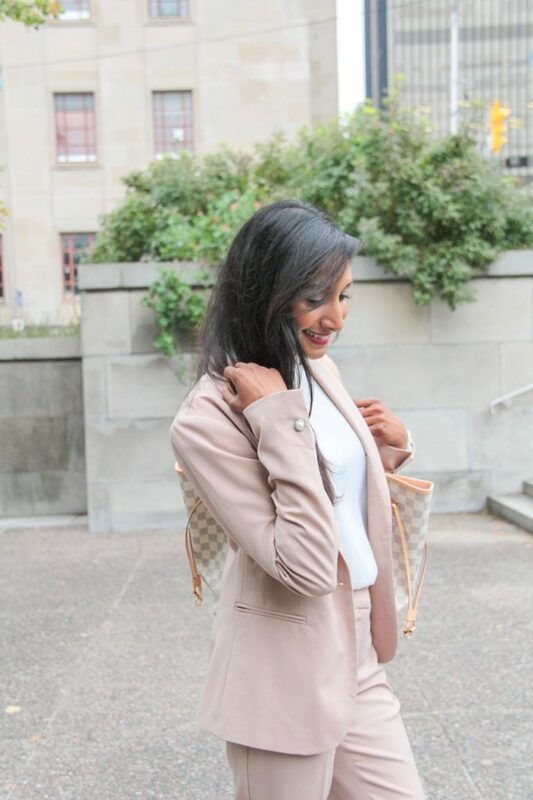 I love the feminine detail of the pearl button on this dusty pink blazer, so pretty! What are your top 3 fashion tips for great 9 to 5 style? Look for fit when shopping for workwear pieces and if that blazer you absolutely love is just a tad baggier than you’d like, consider getting it altered for a better fit. Make sure you don’t have any stray threads or tags hanging off your clothing and always iron or press your clothes. A well pressed outfit just looks more polished and professional. Many people think that workwear should be boring and restricted to black or grey pant suits but a feminine structured dress or skirt does the job too. I find myself drawn to colourful work dresses and feminine details on blouses and skirts. Dresses and skirts are versatile pieces as you can wear them year round, simply add opaque tights and a cardigan for the Fall and Winter. 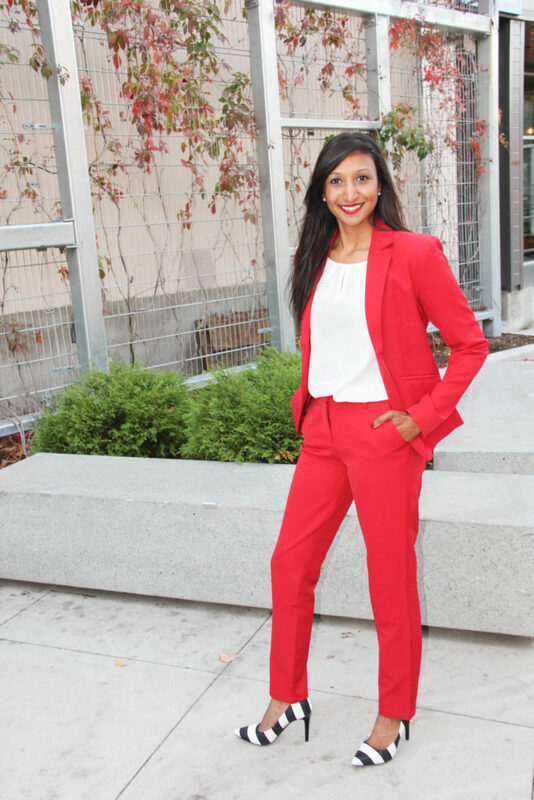 Nothing makes you feel more motivated at the office than wearing a great power suit. Although work wear may sometimes be labeled as boring adhering to your company’s dress code doesn’t mean you have to skimp on colour. 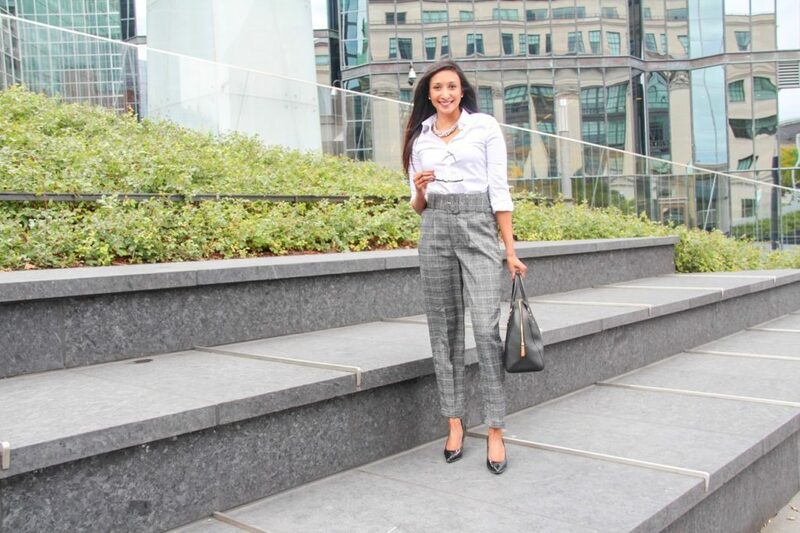 I find a lot of work wear whether it be dresses, skirts or pants tends to come in the stereotypical boring I mean boardroom colours – black and grey. That’s why I was so excited when I spotted this fabulous red blazer at Suzy Shier. I was happy to find that there was a pair of matching pants. Suzy Shier is very reasonably priced when it comes to work wear and often has promotions that offer the pants free when you buy the blazer or vice versa. Promotion or not I was extremely pleased with the cut and fit of both the pants and the blazer. Suzy Shier does offer work wear in the traditional colours but I was happy to see some variation as well. I often shop there for my work wear and get a lot of complements and questions about where I got my clothes. Suzy also has a great sales and their 40% off the entire store sale is something I look forward to. If you live in Canada I would recommend checking them out, you never know what you’ll find. I paired this red hot suit with a classic white short sleeved blouse and these super cute Siriano for Payless black and white pumps. The bag is a Louis Vuitton I invested in a few years ago. It’s a great bag for work as it’s structured and sturdy with reinforced handles. I also use the LV Neverfull MM which is another great tote for work – it literally never gets full. I can honestly say you get your money’s worth with Louis Vuitton bags. I’ve had my Neverfull for about 7 years now and it’s still going strong. This weekend I had the pleasure of participating in the 4th annual Immigrant Women’s Small Business Expo. The event is hosted by Canadian Small Business Women. I’ve had the privilege of being a part of the Ottawa event since it’s inception in 2013. This year I was part of the panel, as I have been in the past but I also got the chance to promote my blog. For this event I wanted to achieve a business chic look. I decided to pair this cream pencil skirt with a ruffle from Dynamite , with a great sheer bodysuit from Guess by Marciano. The skirt is fitted and not very forgiving so I opted for a body suit to achieve a more clean, sleek look. I topped it off with these super comfy, lace up block heels by Christian Siriano for Payless Shoes.